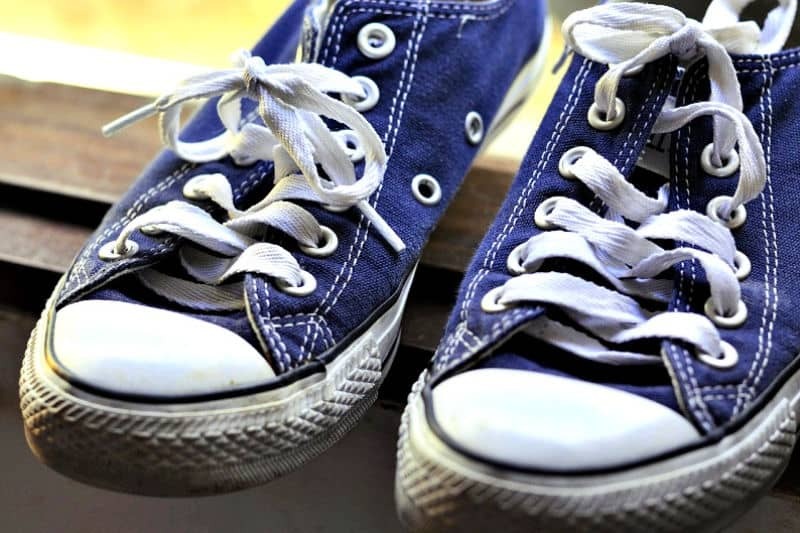 If you’ve got teens, you need to know how to deodorize smelly shoes. It’s that, or learn to love opening windows even in the dead of winter. Teens aren’t the only ones whose shoes stink, though. People who are on their feet all day, people who wear sneakers or tennis shoes to exercise, and people who wear heavy work boots all deal with foot odor. Even slippers and house-shoes begin to smell. Here’s help! These tips will get rid of shoe odors, and there’s a bonus homemade shoe deodorizing powder recipe, too. Your feet contain 250,000 sweat glands! When those sweat glands are stuck in a shoe that’s not ventilated, the sweat and warmth create a breeding ground for bacteria. Horrible shoe odor is the result of bacteria multiplying in the sweaty environment of your shoe. 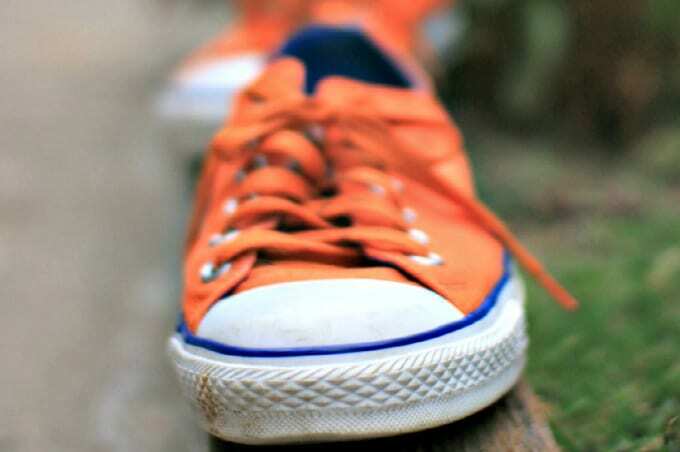 To get rid of smelly shoes, you need to destroy the bacteria. These tips on deodorizing smelly shoes and the homemade, all-natural shoe deodorizing powders below, will help. Shoes made of fabric can be tossed in the washer and laundered in a warm (not hot!) cycle using your regular laundry detergent. To deodorize smelly fabric shoes, add 1 cup of white vinegar to the rinse. 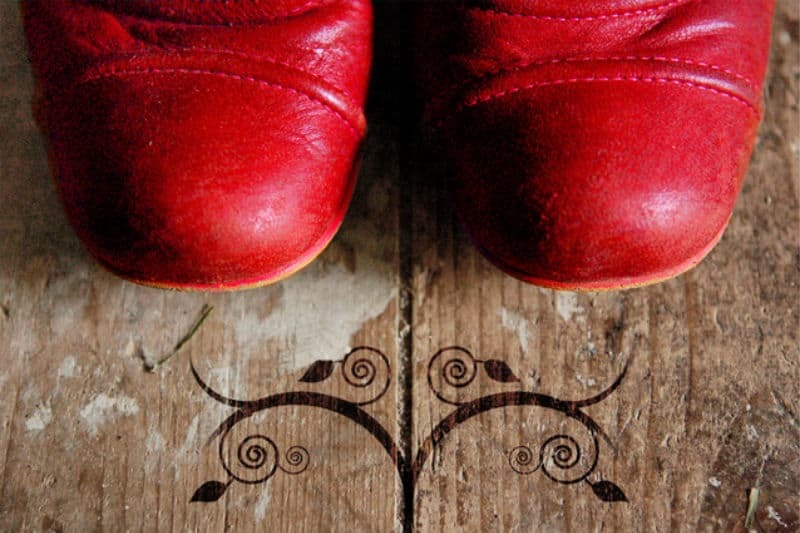 Don’t use fabric softener, though — its surfactants can trap bacteria in your shoe. Tumble freshly-washed tennis shoes in a dryer with towels. If you can’t stand that banging sound, slip them into a bag that fits over your dryer’s door. Or place them outdoors in a sunny spot to air-dry — sunlight is a great way to get rid of smelly shoes! Spritz the Homemade Shoe Deodorizing Spray (below) onto a clean, dry cloth and wipe the shoe interior. Use a different clean cloth to wipe away any remaining spray, so your shoe does not stay damp. Alternatively, you can deodorize smelly leather shoes using a disinfecting wipe. Be sure to follow with a damp and then a dry cloth to remove residue because the disinfectant may cause skin irritation. Make a paste using a few drops of water and the Homemade Shoe Deodorizing Powder (below). Dip an old toothbrush into this paste and rub it over the cork insole. Wait 5 minutes then wipe the paste away using a clean, damp cloth. Once all the paste is gone, press a dry cloth onto the insole to remove any moisture. To deodorize shoe inserts, slip them out of the shoes and wash them in a sink full of warm, soapy water. Drain and refill the basin with 2 cups water and 1 cup white vinegar. Let them soak for 5-10 minutes then rinse, gently press the insole to remove as much water as possible, and allow them to air-dry away from direct sunlight before putting them back in your shoe. Wear socks to absorb moisture. If you don’t like the look, try a no-show sock that won’t ruin your style. Don’t wear the same shoes two days in a row, so they have a chance to dry between wearings. Clean your shoes at least once per season using the appropriate method above. For longer-term storage, stuff shoes with newspaper to absorb sweat. You can optionally sprinkle them with shoe deodorizing powder first. Some people report that freezing shoes overnight (wrapped in a plastic bag) is a great way to eliminate shoe odor. The dry ingredients in this homemade deodorizing powder are odor absorbing, and the tea tree oil’s antiseptic properties help the kill bacteria that cause smelly shoes. Dump out the dust before wearing your shoes. 1. Shake or stir until thoroughly mixed. 3. Dump the powder out before wearing. Some people swear by deodorizing smelly shoes with Febreze after each wear. If you don’t have skin allergies or sensitivities to corn, that’s worth a try. Here’s a homemade, all-natural shoe deodorizing spray if you’d rather DIY it. 1. Lightly mist shoe insoles after each wearing. 2. Let your shoes air dry. 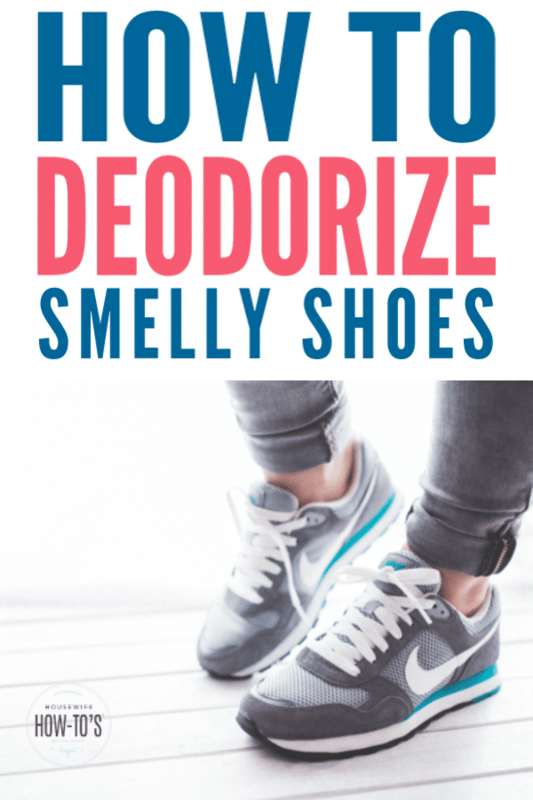 Pin How to Deodorize Smelly Shoes for later! I tried alcohol on a pair of Keds…it did rid them of “foot odor” but now they smell strong of rubber/chemical as if the alcohol broke down the inner sole. I’ll try some of these suggestions. The rubbing alcohol probably did break down some of the inner sole. That’s why I don’t recommend it. The shoe powder I mentioned works very well, and hasn’t harmed my Keds or any other shoes I love. Sneakers are the worst, so try this. Rubbing alcohol, soak them for a couple of hours. Put them flat in a baking pan and pour the alcohol into them. Or mix up a dilute clorox solution and do the same. Then let them sit out in the hot sun for a couple of days. Wear other shoes while these dry. Rotate your sneakers too. Its the bacteria which you have to kill. Kitchen sponges will stink too, so squeeze them full of dish detergent, and let them sit in sun to completely dry, rotate sponges too. Have 2 or 3 on hand. That works to dry them, but doesn’t necessarily kill the bacteria that lead to foot odor. As soon as you put the shoe back on your nice, warm foot the stink returns. Can’t wait to try this, I have several pairs of shoes that need help, as I hate to wear socks! you totally saved me with this article!! tried everything under the sun – how did I not think of white vinegar!! I’m glad to have helped, Zizi! Thank goodness I live in Canada! I’ll just leave my shoes outside overnight tonight! Or just use Napthalene balls (Air/room freshners). Kills all the smell in no time. Powdering n sprinkling in shoe will help while traveling as well. Uhh… Great post, but freezing doesn’t kill most bacteria or fungi. I’ll definitely try the homemade powder idea though! Freezing kills the microbes that thrive in warmth. And generally, feet aren’t sweating if they’re cold. So, I’d say freezing them to kill the microbes that are breaking down dead skin and causing the stink makes the most sense. I like the idea of sprinkling the shoes with a deodorizer, but why use baking powder instead of baking soda?